For those interested in what we’ve been busy working on for the past couple of months, this is it! 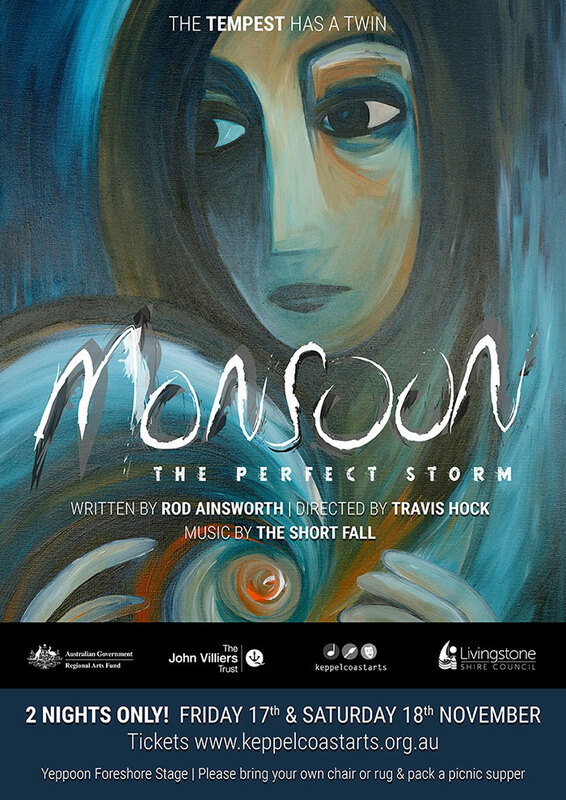 We’ve been commissioned by Keppel Coast Arts to write the musical score for a brand new play called Monsoon. We’re currently in the process of finishing writing and recording all the parts. Monsoon isn’t some song and dance style musical – while there are a couple of songs, it’s a really deep & at times dark story that has been inspired by the events of Cyclone Marcia, centering around the story of a boy and a girl – twins – two forces that must, by all means, be kept apart – set against an epic, intergenerational story of two real people – a father and a daughter. The music is trippy, dark and a far cry from anything we’ve created before – Ryan goes absolutely nuts with this guitar effects, and it’s something we’re incredibly proud to be a part of. Directed by our good friend, Travis Hock from Lock&Hock Productions, and written by playwright Rod Ainsworth, Monsoon will feature a local cast and is set against the beautiful backdrop of the Yeppoon Main beach, where it will be presented on the brand new Foreshore stage. This is something we’d love you guys to come and watch! We’ll be posting some samples and info here soon so stay tuned!